7 days a week--6 a.m. to 6 p.m.
Super Strike Charters has been in business for 18 years. We are located in Venice, La. which is the best fishing destination in the country. Our boats are located at the Venice Marina. We have 5 boats. 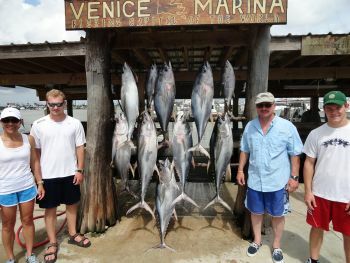 3 Offshore and 2 Inshore boats to fish for all the species that Venice has to offer and to accommodate large groups. Lodging is also available at our floating lodge which is located at the Venice marina. The lodge has all the comforts of home including a large kitchen, satellite TV. Two bedrooms/1 bath and can sleep 6.